So the Higgs Boson has finally been glimpsed. Science is finished as we know it because we know all there is to know. Well obviously we don't know it all and science has probably still got a future with us after all. But the name Higgs Boson has long been clamed the "Holy Grail" of Physics. Already people are claiming various spin off's from faster computers to better hospital scanners. The excitement that has been generated about this glimpse has nearly reached fever pitch in the national press. Higgs hunters are said to be on tenterhooks. I'm not sure exactly what "tenterhooks" are but it certainly sounds very exciting. So why has this sub atomic particle become such a holy grail of science. The answer is Good Publicity. So . . . . . . . . In Physics there is a theory for how the Universe works - all of the particles that make up atoms and molecules and all the matter we see, along with more exotic particles have been mapped. This is called the Standard Model. However, there is a glaring hole in the theory, because it doesn't explain how particles have mass. Mass is a measure of how much density any thing has. Density means stuff and not weight, an example of this could be comparing two objects that have the same physical dimensions. A cork ball and a metal ball could appear to be the same size but they are made up of different density stuff! 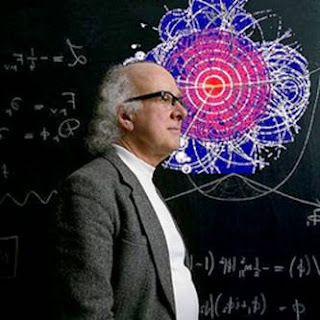 The Higgs mechanism was proposed In 1964 six physicists, including the Edinburgh-based theoretician Peter Higgs, who proposed a theory to explain the existence of mass as an explanation to fill this hole. The Higgs mechanism proposes that there is a field permeating the Universe - the Higgs field. It has been explained in simple terms recently on national radio as "the way a celebrity attracts the paparazzi to gather round whenever they appear in public." If viewed from a distance it might appear as if the paparazzi were being drawn in and clinging to the Celeb. Probably a huge over simplification I'm sure but a good starting point to intuit the general idea.of the Higgs field. If such a thing could be seen then the standard model of the universe can be accepted and a complete understanding of the universe works can be reached. If it turns out that the Higgs field has not been glimpsed then this means that the standard model is wrong and science can live again. Although it would be a huge achievement for science to find the elusive Higgs boson it would be far more exciting for it not to be found because the standard model would have to be completely rewritten. Science is about discovering stuff and although this discovery may be closing a chapter for understanding there is still so much we don't know. Now any one heard about those neutrons that travel faster than light?